So, kids, what are you doing this summer? Reading? Good for you! So why am I shilling for Barnes & Noble here? 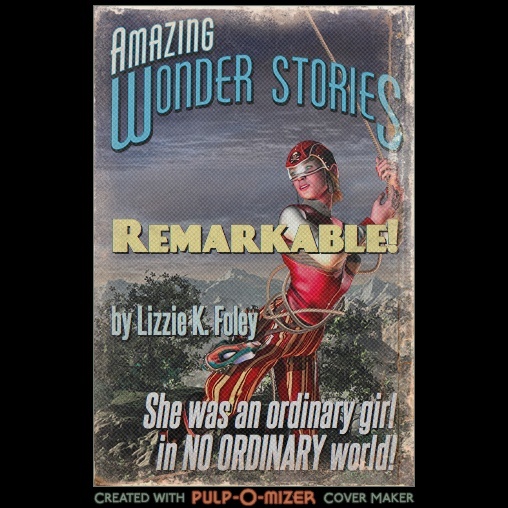 Because one of the books you can select as your free book is Remarkable, by Elizabeth “Lizzie K.” Foley, which, as discussed previously, is the single greatest novel in the history of the English language. Do not be distracted by the My Little Pony: Meet the Ponies of Ponyville. The ponies can wait. Read your eight (8) books, and then run, don’t walk (but stop and look both ways before crossing any streets — also, take a responsible adult with you) to your nearest Barnes & Noble and pick up your free (FREE!) 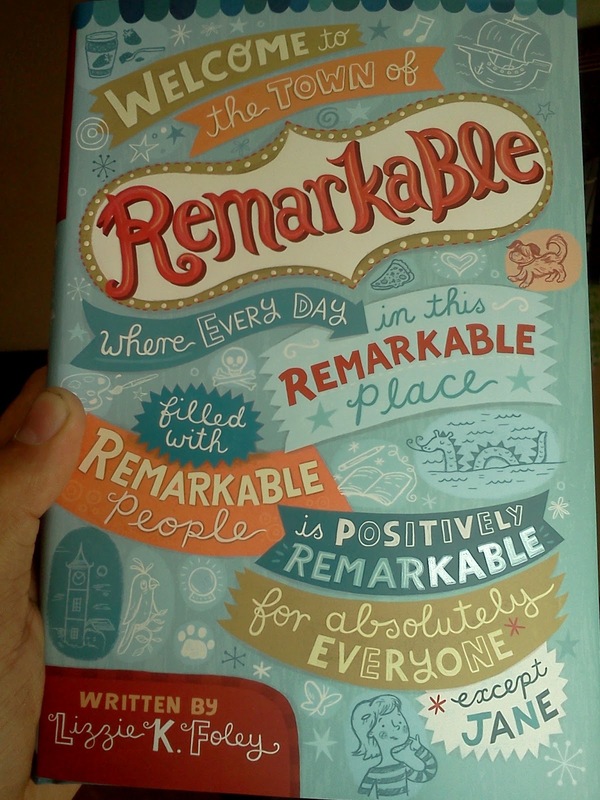 copy of Remarkable. Foreground: The nineteen best books ever written. Background: Our new kitchen wall color. Pictured: Jane, The Pirate Ship Mozart Kugeln, Lucky the Lake Monster, The Mansion at the Top of Remarkable Hill, the Bell Tower (under construction). Not pictured: the nefariously identical Grimlet Twins, Melissa and Eddie, Remarkable’s School for the Remarkably Gifted, Ebb, Jeb, Flotsam, Madame Gladiola, Penelope Hope Adelaide Catalina, Anderson Brigby Bright Doe III, Lucinda Wilhelmina Hinojosa, Mad Captain Penzing the Horrific, and more. That means that, yes, you can now get this excellent book in paperback form, which is both more affordable and more bendable than the original! Should you buy it? Yes! Why? Let me tell you! A lot of outlandish entertainment. A rich, unforgettable story that’s quite simply — amazing. The story centers on the town of Remarkable, where all of the residents are gifted, talented, and extraordinary. Everyone in the town is a world-class musician, or writer, or architect . . . In fact, she is the only student in the entire town who attends the public school, rather than Remarkable’s School for the Remarkably Gifted. But everything changes when the Grimlet Twins join her class and pirates arrive in town. Plus, there’s a weather machine, a psychic pizza lady, a shy lake monster, and dentistry. The book is both funny and thoughtful. You can enjoy it as a goofy adventure full of wacky characters and wordplay. 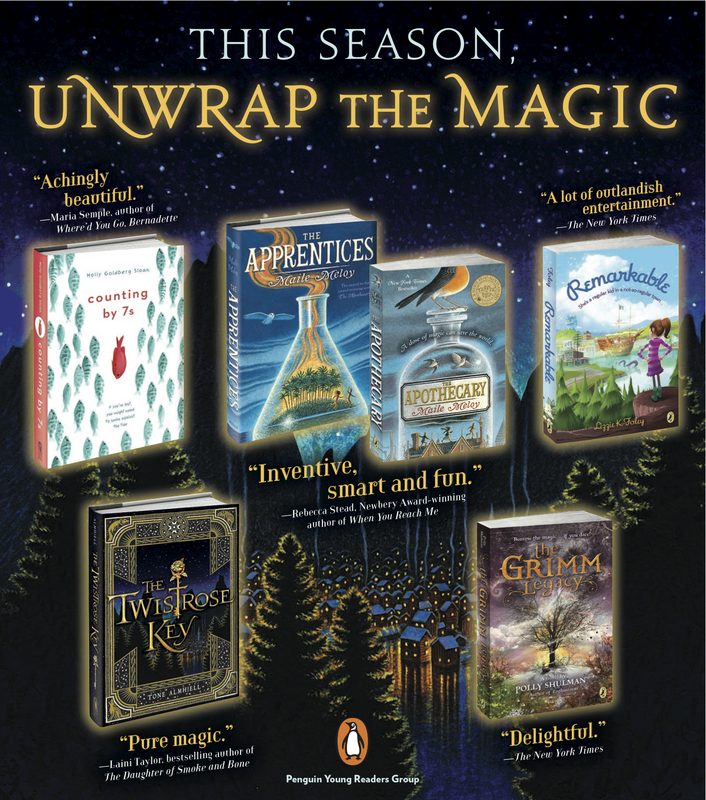 It’s for ages eight and up, but if you’re an grown up who likes kids’ books at all, you’ll find that there is a lot here to engage the adult reader. The world is a wonderfully rich place, especially when you aren’t trapped by thinking that you’re only as worthwhile as your best attribute. . . . It’s the problem with Remarkable, you know. . . . Everyone is so busy being talented, or special, or gifted, or wonderful at something that sometimes they forget to be happy. Now, I know, you’re thinking to yourself that you should take my endorsement with a grain of salt. After all, Lizzie Foley is my wife, and I can’t be trusted to provide an honest, unbiased assessment of her book . . .
I’m gonna give you some straight talk on correlation versus causation. You might assume that I like this book because I’m married to the person who wrote it. You would not be more wrong. In fact, if I did not know Lizzie Foley, and I read this book, I would track her down and marry her. So, yes, you should run out right now and get yourself a copy of this book. You should give it to your ten year old, or you should read it with your eight year old, or you should just curl up with it yourself. Just remember, she’s already married. I’m looking at you, Ryan Gosling! 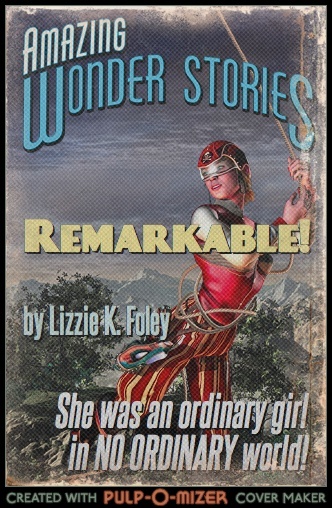 So, you already know that my wife, Lizzie K. Foley, wrote a book called Remarkable, which was published in 2012 and is, quite probably, the greatest middle-grade novel ever written. If you are a kid aged 8 and up, or if you know a kid aged 8 and up, you should buy it. This is not what the cover looks like, but this is what the cover would look like if it had been published in the pulp era of science fiction magazines. This was created using the PULP-O-MIZER, which I encourage you to waste the next several hours playing with. For completeness, and to facilitate your resharing needs, here’s that cover rendered in square, “facebook-friendly” format (which avoids the weird cropping thing that happens when you post tall images there). Remarkable comes out in three days!!! 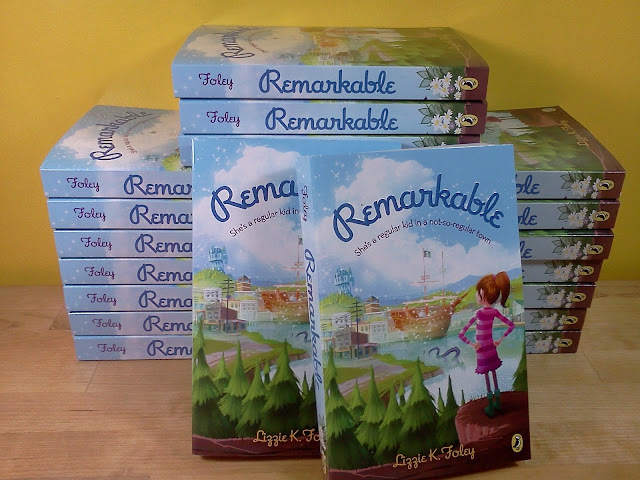 So, it is now three days until Remarkable, the middle-grade novel by my wife, Lizzie K. Foley, officially comes out. She got a nice surprise this weekend when she found a review in the Sunday Book Review of the New York Times. You can find the review online here. Also, out today is an interview about the book with Jennie Bailey, who was a classmate of Lizzie’s at USC film school. She talks about the book, and about writing in general. It’s a great interview, and if you leave a comment, you’ll get a chance to win a free copy of the book, which will free up funds for you to buy a copy of the book as a gift for someone else! This book will have you remarking on how excellent it is. For ages 8 and up. For those of you who have not already read my spiels about the book, the setting is the town of Remarkable, where everyone has extraordinary talents, except for the protagonist, Jane. Jane is, among other things, the only student at the public school, since every other kid in town attends Remarkable’s School for the Remarkably Gifted. Her life is extraordinarily boring, at least until the criminally gifted Grimlet Twins get expelled and join her in the public school. Add in pirates, a psychic, a lake monster, dentists, and a mysterious howling, and you have the literary equivalent of a seven-scoop ice-cream sundae topped with chocolate awesome. The book will be out this Thursday, April 12. The local bookstore here, Watchung Booksellers, is going to be hosting a launch party on Saturday, April 14 at 1 pm, so if you’re in the Montclair, NJ area, stop on by! So, here’s some more Remarkable news for you. Every month, Amazon selects a few “Best Books of the Month” in each of a few categories, including four in the middle-grade fiction genre. Well, for April, one of those four is Lizzie K. Foley‘s Remarkable! Check it out! Want to know what the book is about? Read this review from Kirkus, which I previously posted here. It’s perfect for ages 8 and up. As those of you who know me already know — as well as those of you who have read my previous posts — Lizzie Foley is my lovely and talented wife. Obviously, that means that my assessment of the book is probably biased. However, once I correct for that bias, I have to say that this is THE MOST AWESOME BOOK IN THE HISTORY OF THE WORLD EVER!!! You can preorder the book now from various places, or buy it in person from a bookstore starting on April 12. Please note that a fraction of the proceeds from each sale will go to the Keep-Jon-Wilkins-from-Having-to-Turn-to-Prostitution Fund (KJfHtTtPF). So, regular readers here already know that my wife‘s novel, Remarkable, is coming out in April. On April 12, to be exact. That’s two weeks from today, which means that the Kirkus review of the book just came out from behind their paywall. The title of this debut says it all. In the town of Remarkable, so named for its abundance of talented citizens, everyone lives up to its reputation. Well, almost everyone. With a famous architect mother, an award-winning–novelist father, a photorealistic-portrait–painter older brother and a math-genius younger sister, Jane should be just as remarkable. Instead, this average 10-year-old girl is usually overlooked. With clever wordplay, the third-person account paints a humorous and vivid depiction of this unusual community. While the rest of the town’s children attend Remarkable’s School for the Remarkably Gifted, Jane spends monotonous days as the public school’s only attendee. Excitement suddenly enters her life when the mischievous Grimlet twins get expelled from the gifted school and sent to public school, not one but four pirates enter town and a search ensues for a missing composer. Mix in a rival town’s dispute over jelly, hints of a Loch Ness Monster–like creature and a psychic pizzeria owner who sees the future in her reflective pizza pans, and this uproarious mystery becomes—if even possible—a whole lot funnier. With the help of her quiet Grandpa John, who’s also forgotten most of the time, Jane learns to be true to herself and celebrate the ordinary in life. 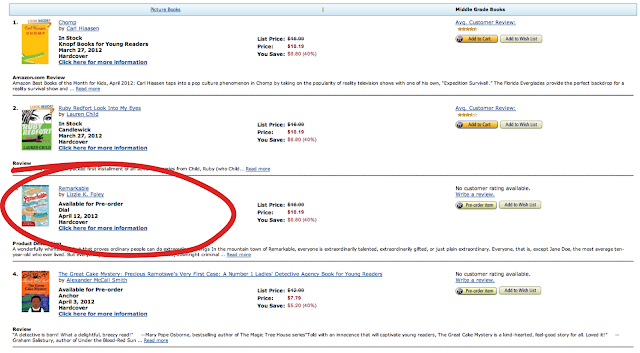 Now, go visit Kirkus, where they have links to Amazon, Barnes and Noble, and Indiebound, and order the book! And, you know, as awesome as the cover is, all those words on the inside are even better! YReady, YSet, YGO! The YAmazing Race! So, do you like free stuff? Do you like the internet? Well, then, you’re in luck! Starting today, you can participate in The YAmazing Race. What is it? Well . . . 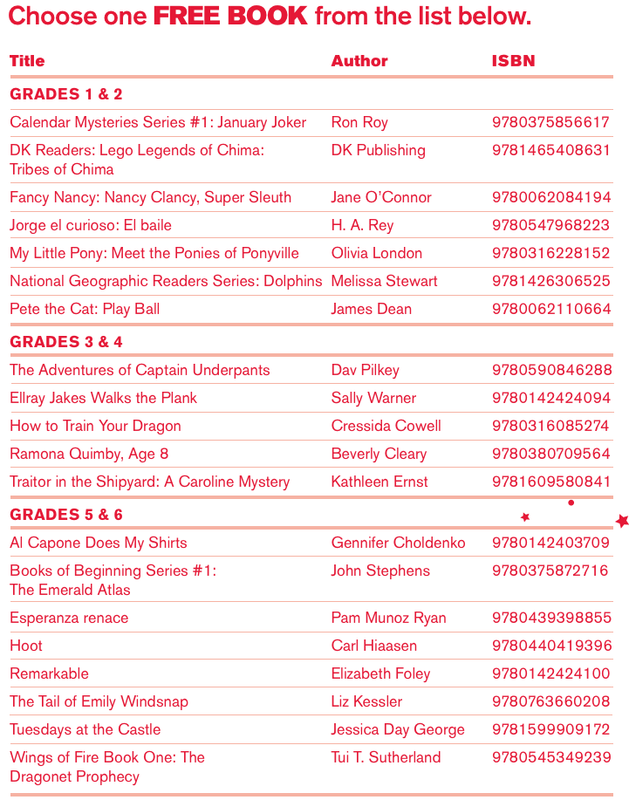 This is a sort of blog tour being run by the apocalypsies, a group of authors whose debut middle-grade and young-adult novels are coming out in 2012. [My wife is a member.] The idea is this: you start off at the apocalypsies website, and it will point you to the page of one of the authors. There, you will read a little bit about that author’s book. Then, you’ll follow a link to the next authors’ page, and so on. Then, you’ll answer a few questions about the books for a chance to win fabulous prizes! Note, although it is a “race,” the contest is about accuracy, rather than speed. You’ve got a week. Read the full rules, and get started here. What do the authors get out of this? Well, the idea, of course, is to generate some exposure for their books. What do you get out of it? Two things. First, you might win some free books, gift cards, t-shirts, CDs, and so on. Second, you might discover the next book you want to read. Or maybe the next book you want to buy for your fifteen-year-old niece, who is suffering from withdrawal after having finished the Twilight books. So, we’re now within three months of the release date of my wife‘s debut middle-grade novel, Remarkable. One of the interesting side benefits of this has been that she has gotten to know a number of other authors whose debut middle-grade or young-adult novels are also coming out this year. One of those other authors is Jessica Spotswood, whose debut young-adult novel, Born Wicked, comes out from Putnam on February 7. 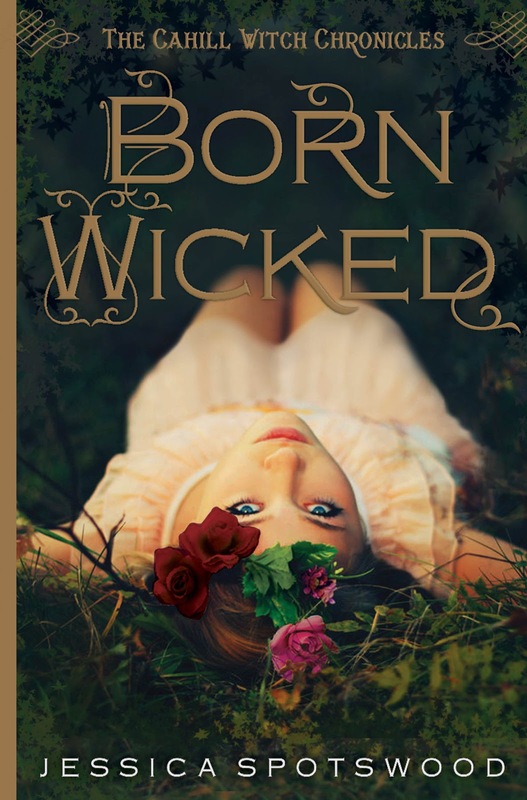 Also, if you hop over to her blog and comment on this post before Sunday, January 15, you will be entered in a drawing to win one of three advance copies of Born Wicked, or an advance copy of one of three other books: Gilt by Katherine Longshore, Harbinger by Sara Wilson Etienne, and Remarkable by the awesome, unparalleled, gorgeous, brilliant, talented, remarkable! Lizzie K. Foley. 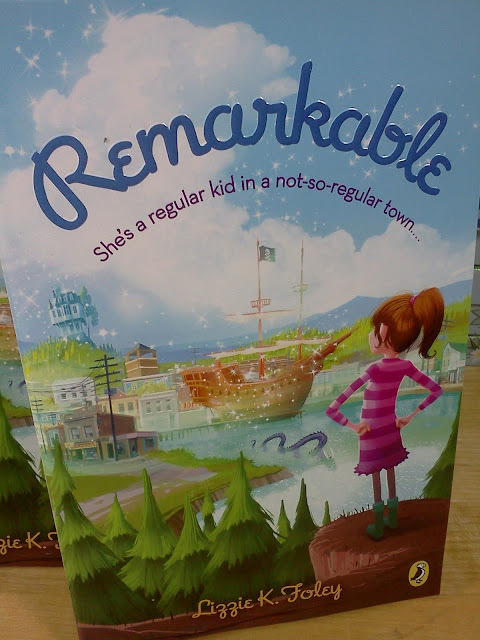 So, one of our regular features here at LiT consists of updates on my wife‘s forthcoming middle-grade novel, Remarkable. This update comes via Elizabeth Bird‘s blog, which I believe is called A Fuse #8 Production. She is a children’s librarian in the New York Public Library system. So they introduce Remarkable by Lizzie K. Foley to us by saying that it’s the most impressive debut they’ve seen since Savvy. Strong words, no? Then they proceeded to compare it to Holes in terms of its connections between characters. And thus the bar goes up another notch. I’m rather pleased with the premise, though. In the town of Remarkable, everyone there is precisely that . . . except Jane. This may well be a rallying cry for the dorky girls of the world. Or at least the ones with overly talented siblings. Savvy is Ingrid Law’s 2008 Newberry-winning novel, and Holes is Louis Sachar’s 1998 also-Newberry-winning novel. In 2003, Holes was made into a movie starring Sigourney Weaver and Jon Voight. Holes also starred a young Shia LaBoeuf in his jump to the big screen. My wife’s book is going to be just like that!